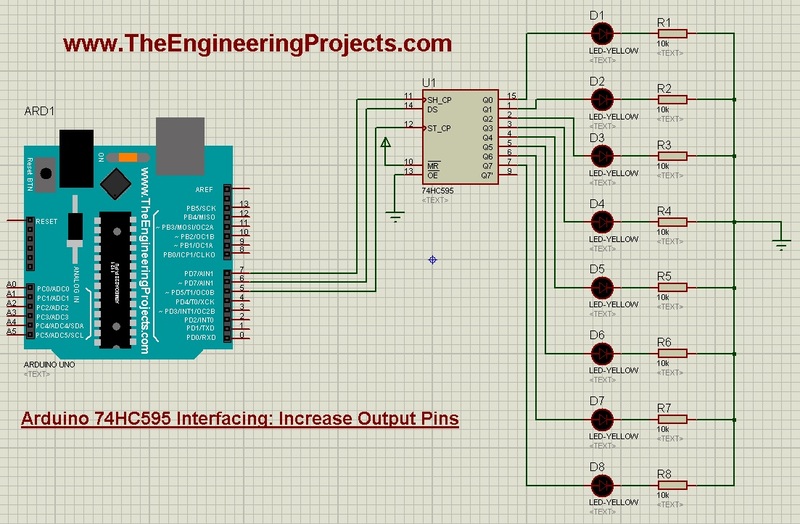 A complete step by step tutorial on Arduino 74HC595 Interfacing to Increase Output Pins. Hello friends, I hope you all are doing great. In today’s tutorial, I am going to show you Arduino 74HC595 Interfacing and we will have a loook at How to Increase Arduino Output Pins with 74HC595. Suppose you are working on some project where you need to control 20 LEDs with Arduino UNO and you know we will 12 digital Pins so we can’t control all of these 20 LEDs with Arduino UNO. We can use Arduino Mega as well but if we wanna stick to Arduino UNO then we need to increase its Output Pins and we will use 74HC595 for that purpose. As I told earlier 74HC595 is a serial In Parallel Out Shift Register and is used to increase the output pins of Arduino. I am gonna use Proteus software and we will design its simulation and then will check out How it works. All output pins of 74HC595 are connected to LEDs. Now upload the below Arduino code and get your hex file. The code is quite simple but let me explain it a bit. First of all we have given names to our 3 Pins connected to Arduino UNO. After that we have made all those 3 Pins as OUTPUT as we are gonna send the data. We are using single chip of 74HC595 that’s why I have made it 1. In the UpdateData function, you can see we have to make RCLK Low and after that we have sent our data. But for sending each bit of Data we have to make SRCLK from LOW to High. SER is our Serial IN from Arduino to 74HC595. Now let’s have a look at How to connect two 74HC595 chips in parallel to increase the output pins to 16. I have also given these Proteus simulations for download at the end of this tutorial but I would recommend you to design them on your own so that you got better understanding of this shift register. 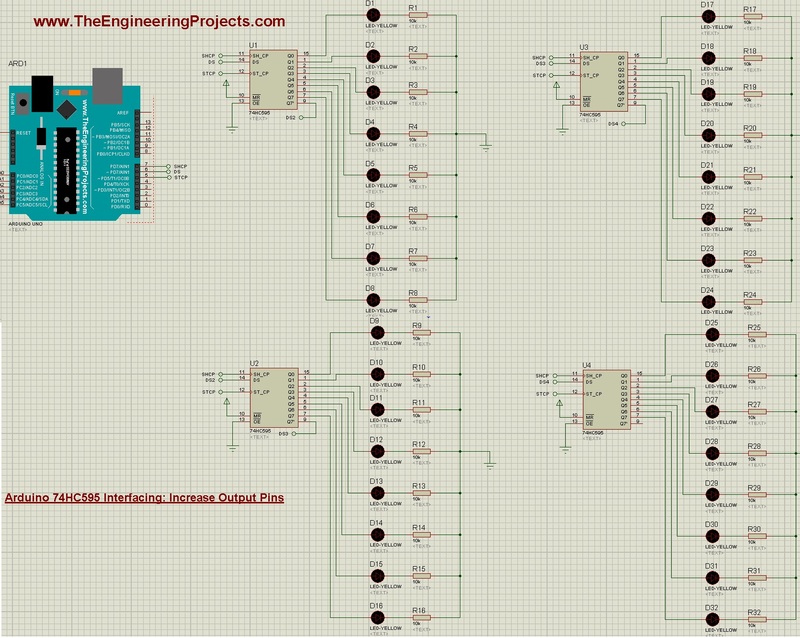 Now we are gonna place two shift registers in parallel and we will be able to control 16 outputs from single Arduino Pin. Although we are using 3 Arduino Pins but the data is sent through Pin # 6 of Arduino and Pin # 5 and 7 are CLK Pins. Now in Arduino Code, you just need to change the TotalIC to 2 and as you have seen we have already multiplied it with 8 so now our for loop will move from 0 to 15. Pin # 5 and 7 will simply connected to same pins of second shift register but DS will be connected to Q7′ of first shift register. Now let’s make it a bit more complex by adding 4 shift registers in parallel. We have followed the same principal, Q7′ of second chip is connected to DS to 3rd chip and goes on. I have placed these default Pins instead of connecting the wires, it works the same. If this image is not clear then open it in new tab and zoom out to check the connections. Now in your Arduino code, you need to change the TotalIC to 4, as now we are using four chips. 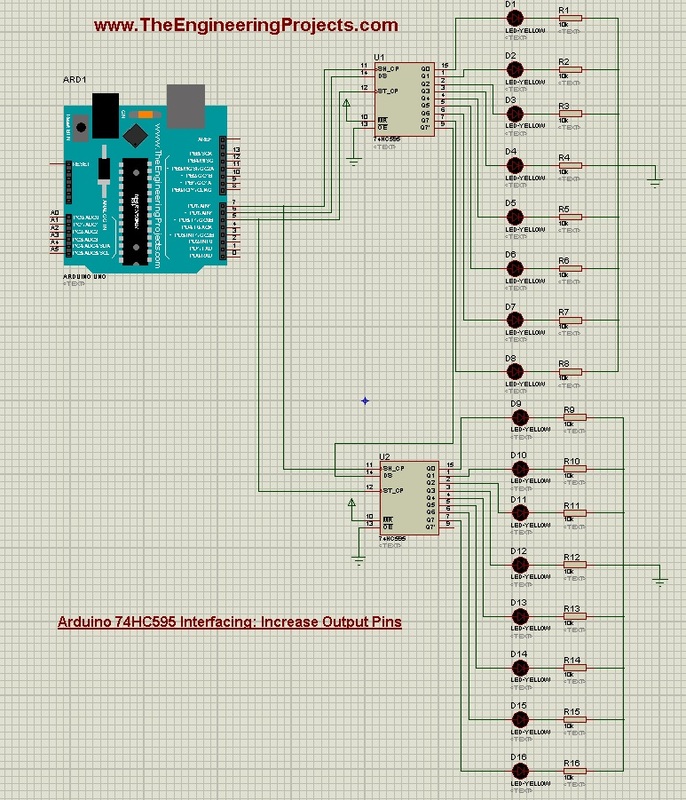 So, that’s How you can quite easily do the Arduino 74HC595 Interfacing and can increase Arduino outputs as much as you want.